Teenage health blogger Gabriella Schneider and certified Nutritional Therapy Practitioner Michael Blaustone join our hosts Jimmy Moore and Dietitian Cassie today in Episode 137 of "Low-Carb Conversations With Jimmy Moore, Dietitian Cassie & Friends!" The year 2015 is well underway and we've been having some great episodes so far this year. Our guest friends so far this year have been especially good and we're so honored to have them chiming in on the latest health headlines of the day with our hosts Jimmy and Dietitian Cassie. We hope you look forward to listening to this podcast as much as we do having fun recording it. Do you find benefit in what you hear each and every Friday on this podcast? CLICK HERE to make a donation of any amount to support keeping "Low-Carb Conversations" on the air. THANK YOU FOR YOUR SUPPORT! SUPER BOWL AD FOR NATURAL BURGER FROM CARL'S JR. In today's episode, our co-hosts Jimmy Moore and Dietitian Cassie are joined by a teenager dealing with Lyme Disease named Gabriella Schneider from "Beyond The Bite 4 Life" and a certified Nutritional Therapy Practitioner named Michael Blaustone at "Outlook On Wellness". Jimmy and Cassie discuss the upcoming Super Bowl and who they are rooting for (the answer might surprise you), what kind of interesting healthy foods you can serve at a party, and the racy Carl's Jr. Natural grassfed beef burger television commercial that will air on the West coast during the Super Bowl. 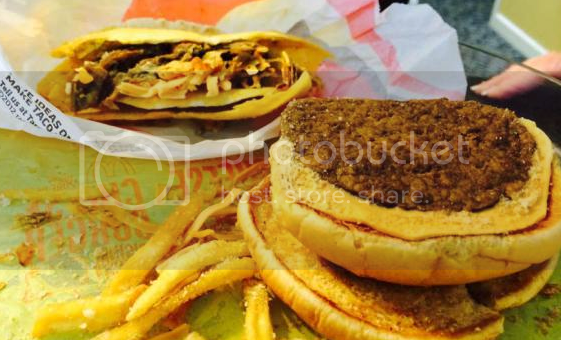 CAN YOU GUESS HOW OLD THIS BURGER, FRIES & TACO IS? Listen in as Jimmy, Cassie, Gabriella, and Michael share their thoughts on how chronic sitting is harmful even if you regularly exercise, why UK-based doctors are being asked to report their overweight patients to the government, the new "low-carb" version of Weight Watchers that is still problematic, the deceptive new "Pub Diet" menu at Applebee's, the obnoxious new apps to dress up fat girls to make them look pretty, and exciting new Nielsen statistics on the popularity of low-carb, high-fat diets around the world. Plus, you won't want to miss Gabriella's Paleo Slow Cooker Mongolian Beef recipe and Michael’s Sneaky Savory Sardine Salad at the end of the show. So pull up a chair, grab a cup of coffee and let's talk! - Gabriella Schneider from "Beyond The Bite 4 Life"
- Michael Blaustone at "Outlook On Wellness"
- VIDEO: Applebee's TV Spot "Introducing The Pub Diet"